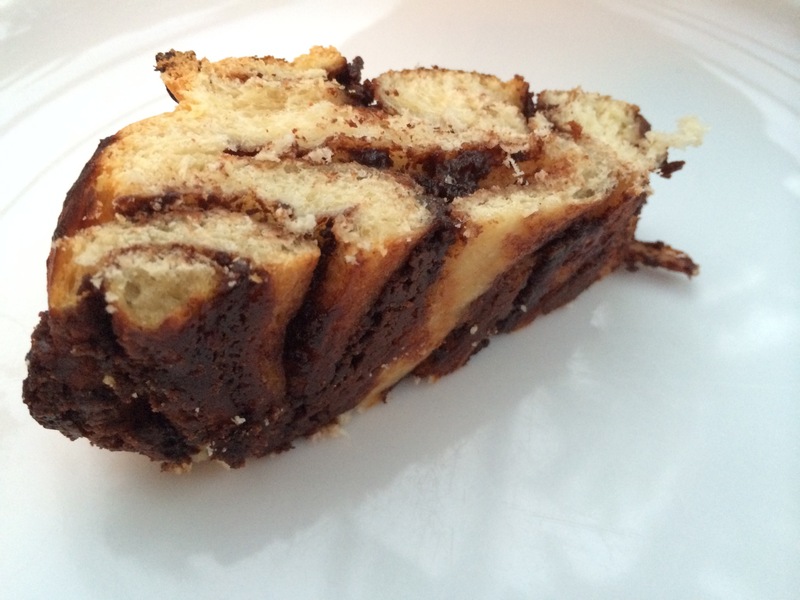 It’s a tricky, sticky thing to get right but it tastes amazing, with each fold of bread hugging a ribbon of Nutella to it. It is the perfect breakfast/afternoon snack type bread, just sweet enough but still nice and filling! – Take a large mixing bowl and add the flour, then add the salt to one side of the bowl and the yeast to the other. – Mix it all together. – Chop your butter up into little bits and add this along with the milk and egg. – Get in there with one hand and mix everything together. – Keep mixing by hand in the bowl. It will be sticky but keep going and after not too long it will start to come together into a cohesive dough. – Keep working it, the trick with a wetter dough is time! – After about 10 minutes you should have a smooth, elastic dough. – Place in a clean, oiled bowl, cover and place somewhere sheltered to rise for 1-2 hours until doubled in size. I found 2 hours about perfect. – Turn out the dough onto a lightly floured worksurface. Do NOT knock it down. – Simply start to roll it out with a rolling pin. You want it to be about 25cm deep and 45cm long. Try to keep it rectangular. 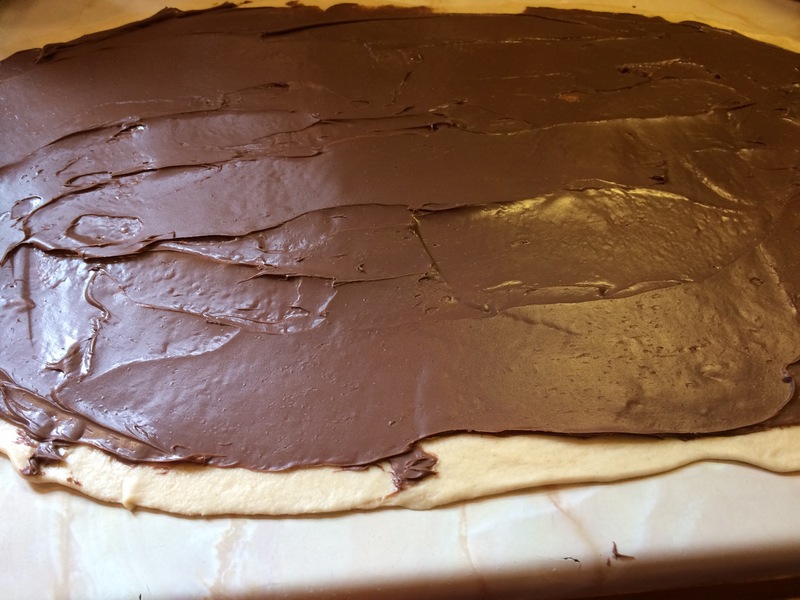 – Spread the Nutella in a thin layer across the dough, leaving a strip nearest you to seal it together at the end. – Carefully roll the long end of the dough towards you, keeping the roll quite tight. – When you have a long roll gently press to seal the dough back to itself. – Starting about 1″ in from the end cut straight through the dough all the way along to the other end. – Now for the messy bit! Twist each half around the other, one over the top, followed by the next, arranging the cut side so it faces uppermost. 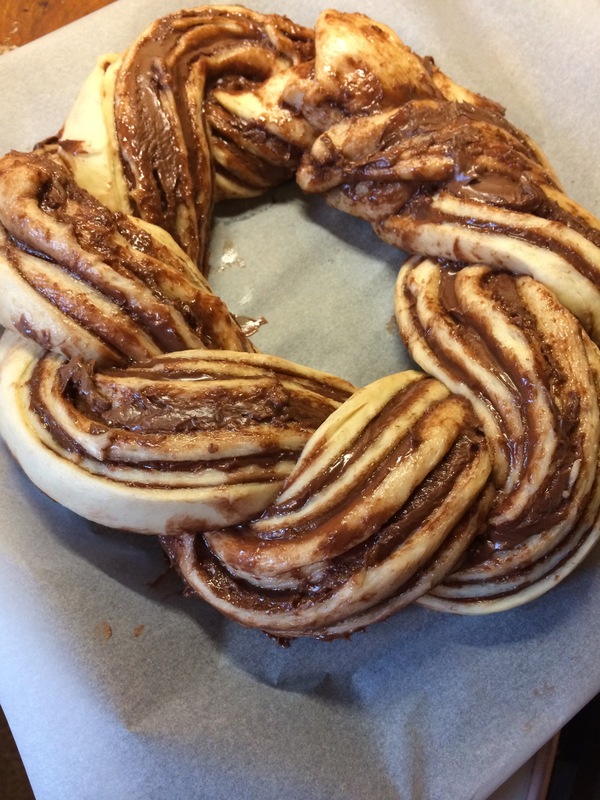 – Gently manoeuver onto a baking tray covered in baking parchment and bring each end round to form a circle. Press the ends together gently to secure. – Place in a plastic bag (bin bags work well here) and leave in a sheltered spot to rise for another hour. – Heat the oven to gas mark 6/200C. – Bake for 25 minutes. – Remove from the oven and leave to cool on a wire cooling rack. Dangerous but so very worth it! 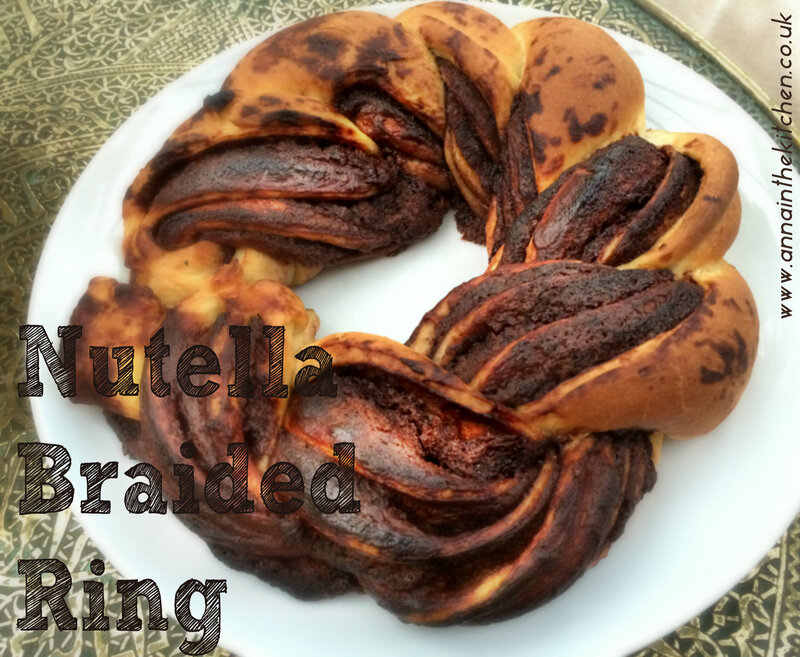 I love this recipe because it takes the simple joy of nutella on bread and elevates it to a whole new level!